GE Free-Standing ranges can be installed free from surrounding cabinetry, as the side panels have a finished appearance. This model features a smooth and seamless ceramic glass cooktop surface that makes cleaning quick and easy, along with electronic oven controls, one-touch electronic pads that are easy-to-use and allow for simple oven operation. GE's TrueTemp System manages oven temperatures to ensure accurate, consistent heating and total cooking performance. GE Free-Standing Ranges can be installed free from surrounding cabinetry, thanks to the side panels that have a finished appearance. The range features a sleek Edge-to-Edge Glass-Ceramic Cooktop that has an amazing resistance to both stains and impact. The heat comes from brightly glowing elements positioned beneath the smooth surface. Even heat is directed straight upwards to the pan for high speed heat transfer. True Convection technology eliminates cold spots within the oven by exposing the oven airspace with hot convicting air that's created by a third hidden element wrapped around the convection fan. Hot air is then distributed into the oven further creates a more even baking experience than from a typical fan convection system. This all-in-one eclectic range includes Downdraft, which integrates the ventilation system so a separate hood is not needed. Smoke and odours can be removed outside or filtered air can be recirculated inside. This range helps you achieve flawless cooking results thanks to Even-Heat True Convection. The unique bow-tie design and convection fan ensure the entire oven is heated perfectly. It also has a Steam Rack that offers the ability to add moisture to the oven and enhances cooking results. 24-inch 2.0 cu. ft. 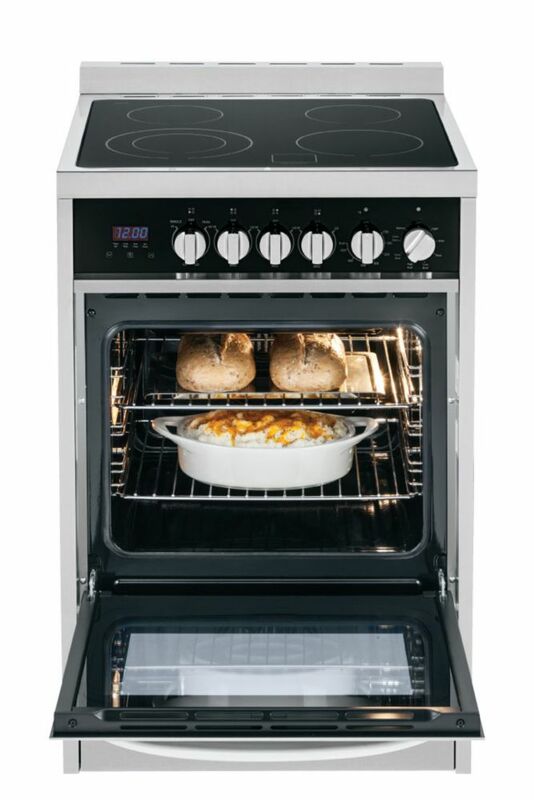 Single Oven Electric Range with Convection Oven in Stainless Steel is rated 4.0 out of 5 by 1. Rated 4 out of 5 by Catmax from Looks nice, no bottom drawer! I am giving this 4 stars just on appearance as I have not used it yet. (In Renovation mode) I like the idea that this model has a convection oven, however was disappointed to find out that it does NOT have a drawer in the bottom, when storage is of most importance in a tiny kitchen that was an issue. I hope It will give me a reason to give 5 stars once I use it! Hi, wondering if you can confirm if this range has a storage drawer? Thanks! Good day, No this does not have a storage drawer. Answered by: MC Commercial Inc. Does this range have a timer? Does this range come in white?